Pilot Rock makes a fun and challenging climb. The Siskiyou Mountains don’t boast the height of the Cascade or Sierra Nevada ranges, but the local mountains still have plenty of wild and beautiful peaks that are fun and challenging for climbers. Here’s four peaks, ranging from easy to difficult, to consider. When it comes to sky-scraping height, the peaks of the Siskiyou Mountains are slightly unimpressive. Compared to the Cascade and Sierra Nevada ranges, the Siskiyous are old, short and unlikely to grace the cover of many picture books. But during the past few years, I've gained an affinity for climbing the highest peaks in these local mountains. The Siskiyous might not reach as high as Mount McLoughlin (9,495 feet), Mount Shasta (14,179) or Mount Whitney (14,505), but they have a craggy character that comes with 200 million years of aging in some cases. The Siskiyous hold multiple shades of bright orange, green, black and silver. They shed most of their snow by mid-July, are devoid of crowds and often feature the unique challenge of route finding to reach the summit. Below I’ve described four of my favorite Siskiyou peaks for climbing, all of which are located off-trial, ranging from easiest to most difficult. All four summits feature breathtaking panoramic views and are open for climbing right now. (Before attempting these peaks, located in very remote areas, make sure you have a map and compass and understand how to use them. A handheld GPS device is highly recommended. Also, for the more difficult climbs, make sure that you're in good to excellent physical shape). The easiest wild peak of the Siskiyou Mountains stands above one of my favorite areas in Josephine County — the Tanner Lakes Basin. A mix of sparkling mountain lakes and greenish silver mountains create a relaxed and beautiful setting whether you're taking your kids camping at Bolan Lake Campground (located just a few miles away) or taking the easy stroll to Tanner Lake. For those seeking just a touch of adventure — without killing the legs — Tanner Mountain makes a nice summit. The easiest route to Tanner Mountain's summit begins at a trailhead for Boundary Trail, 1.5 miles up Forest Service Road 570 from King's Saddle. (For more exact directions, visit www.zachsadventures.com). From a signpost marking Boundary Trail, hike uphill about half of a mile to a grassy meadow. Walk upward through the meadow to a gray outcrop of rocks that marks the summit, and a nice place to eat lunch and enjoy a view that includes East Tanner Lake below, the Marble Mountains, Mount Shasta and the Red Buttes. The highest mountain is Josephine County stands above the Applegate Valley like a beached whale, large and without a very noticeable spire. Nevertheless, the adventurous hike and climb leads up through a wildflower meadow to a summit with beautiful panoramic views. Although not the most difficult climb in the world, reaching the top does require route finding and rock hopping up a steep ridgeline. There are a few different options, but the route I've taken runs from the Upper O'Brien Creek Trailhead for 0.9 miles to a trail junction. At the junction, go right, and in 1.2 miles reach the Boundary Trail junction. From here, go left 133 feet and head off trail to the right, climbing southwest through a grassy meadow toward a silver-gray peak 342 feet above. From the silver-gray peak, follow a faint trail through a wooded area and bushwhack and climb the final 559 feet and 0.8 miles to the summit. The off-trail section climbs 901 feet in one mile and is not easy. (The colony of black flies that call the summit home are particularly annoying). But from the summit, the view extends to the Pacific Ocean and includes the Red Buttes, Siskiyou Wilderness and Mount Shasta, to name just a few. I've written about the adventure of climbing this monolithic king of the Siskiyou Wilderness in the past, but for the sheer difficulty and fun, I had to include it here. Preston Peak is just 7,313 feet, but it rises high above everything around it, making it one of the most noticeable peaks in southwest Oregon and northwest California. Although Mount Ashland holds the title for highest mountain in the Siskiyous at 7,531 feet, Preston Peak is far more interesting and impressive. The route to this summit is best completed as a two-night backpacking trip (unless you happen to be training for the Olympics). The first segment includes hiking 6.8 miles to Raspberry Lake from the Young's Valley trailhead, which is located off Highway 199 in California on Knopki Creek Road. From the lake, the route heads off trail up a steep rockfall on the northwest shoreline, toward an unnamed peak directly above the lake. Behind the peak, you come face to face with Preston Peak and can see the steep, ramp-like route to the top. The ascent up Preston Peak can be scary, passing areas of very steep exposure and requiring a person to use hands and arms to pull themselves up through the cracks in large boulders. In general, though, the climb is best characterized as a grueling trudge up a black staircase. The climb from Raspberry Lake rises a total of 2,313 feet in just two miles, and the entire trip crosses 17.6 miles and more than 5,000 feet of elevation change. From the summit, though, the view includes the Pacific Ocean, along with every major mountain and valley in Southern Oregon and Northern California. One of the most noticeable landmarks in Southern Oregon takes the top spot, not because it's the most difficult physically — Grayback Mountain and Preston Peak both require much more effort — but because of the heart-pounding scramble reaching the summit requires. 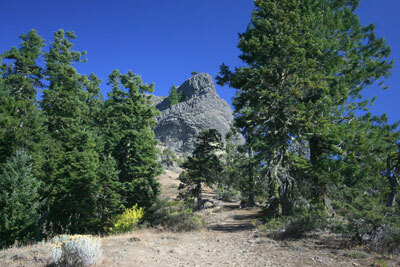 The trail leads from a rock quarry not far from Ashland up an old road 0.7 miles, then shoots uphill past the Pacific Crest Trail for 0.4 miles to base of Pilot Rock. This is where it gets interesting. A mildly terrifying climb is required to reach the actual summit. The route is a Class 3/4 scramble, meaning that you have to pull yourself up in many places and a fall could be deadly. To reach the top, follow a trail circling around the Pilot Rock to the left. Eventually you'll reach a crevasse in the rock. Follow this narrow and very steep slice in the rock, using your hands to pull yourself up in a few places. The 138-foot final ascent isn't exactly difficult if you're in good shape, but the consequences of screwing up are ever present. Do not try this climb when the rock is wet. As with the previous three climbs, the view at the top makes it all worthwhile. Mount Shasta rises in the distance and the entire southern valley spreads out below. The Siskiyou Mountains might not be as tall as the Cascades or Sierra Nevada, but they hold no shortage of exhilarating climbs and breathtaking views.